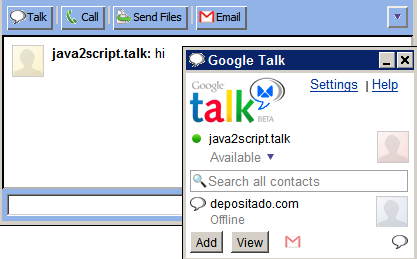 Of course, Meebo also uses AJAX and can be used to chat with your Google Talk contacts. But both are too complex to work on a mobile phone. Now google talk talk with Asterisk, this is great. Because Jabber (the underlying protocol behind Google Talk) is an open protocol, you can get Jabber clients for many smart phones... some of which you have to pay for, but there are certainly ones for free. I found that Empathy (jabber) works just fine with Gtalk. And gtalk2voip will work on any platform. why google talk is not possible for java enable phones(.jar)?